Since the 1850's, the Carr family has been providing funerals and related services to our neighbors throughout Whitinsville and the Blackstone Valley. 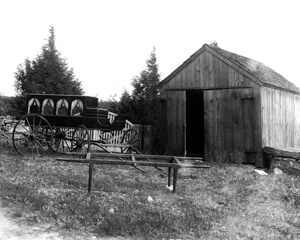 Our founder, Hial C. Carr, who owned a livery stable and blacksmith shop in Whitinsville, began renting hearses and wagons for use at funerals. He was soon providing caskets and directing funerals, in addition to maintaining his other business interests. Hial established the Carr family tradition of serving families in need; that tradition has become a mainstay of our family and the community for more than 150 years. In the 1880's, Hial's two sons, Loammi and Samuel, took over the family business. They continued the livery stable and also ran a stage coach passenger service between Whitinsville, Douglas, and Worcester. This second generation of Carr funeral directors managed the funeral parlor, which was located on the first floor of the Oddfellows Hall on Cottage Street, into the 20th century. In 1910, Morton H. Carr, Samuel's son, became the first in the family to formally study funeral directing and embalming when he enrolled at Professor Renouard's School of Embalming in New York. During Morton's tenure, he introduced the first motorized hearse to the area, and also used it as an ambulance. During the influenza epidemic of 1918, and continuing until 1942 when the Whitin Machine Works took over, the Carr family provided ambulance service for the town of Northbridge. Morton's son, Douglas S. Carr, was licensed as a funeral director in 1941, and upon returning from service in World War II, took over management of the family business. In 1947, he and his wife, Nora, purchased the former Taft estate on Hill Street, and relocated the funeral home from its well-known Cottage Street storefront to our current stately Victorian Mansion location. Doug, Jr. followed in his family's footsteps to become a funeral director; he became licensed in 1974. When his father semi-retired in 1984, Doug and his wife, Jo-Anne, became the fifth generation of Carrs to operate the funeral home. In 2013, Heather Carr Reiter, the oldest daughter of Doug and Jo-Anne, became a licensed funeral director and embalmer, proudly carrying on the family tradition of funeral service into a sixth generation. Looking forward to the second half of our second century as caregivers, we welcome the opportunity to continue our family tradition, drawing on the knowledge and experience we have gained from our history, and applying that knowledge to the challenges yet to come. It is common for people to be unfamiliar with the steps that need to be taken when a death occurs. The necessary steps usually depend on the circumstances as well as the location. We at Carr Funeral Home are dedicated to ensuring that you have the information that you need in these circumstances to make these important decisions. Unanticipated death at home or elsewhere—In these situations, you should contact 911 immediately. Police and emergency medical personnel will then determine the appropriate steps. In most instances, the authorities can release the deceased directly to our care so that preparations may begin. In some situations, however, the deceased may need to be taken to the Medical Examiner’s office; this occurs when the cause of death may not yet be known. If death occurs in an Institution—Should the death occur at a hospital or care home (nursing/convalescent home), the medical staff present should handle all necessary legal steps. You simply need to inform the staff that Carr Funeral Home is handling arrangements. There will be some accompanying paperwork to authorize the release of the deceased to our care. Anticipated death at home—Today, more people with terminal illnesses elect to remain in the comfort of their home under Hospice care in the final stages of their illness. In this situation, you should inform Hospice that Carr Funeral Home will manage the arrangements. Hospice will then supervise the necessary legal requirements. Often, when someone is faced with a terminal illness, the family will decide to make arrangements in advance—saving them the time and emotional decisions needed at the time of death. Death out-of-state—If the death occurs out of state, you should call Carr Funeral Home toll-free at (877) 491-8412. We can then coordinate the transfer with a local funeral director at the place of death. By calling us first, we can often save families money by making all necessary arrangements. This is a brief explanation of what you may need to know in certain circumstances. Please feel free to call us or email; we are here to help and to serve you, and we encourage you to contact us if you would like further information.